Home / Entertainment / Bollywood / Anand Ahuja proposed Sonam Kapoor without a ring? Anand did not have a ring when he popped the question to Sonam, and the actor said ‘yes’ without waiting for a ring. 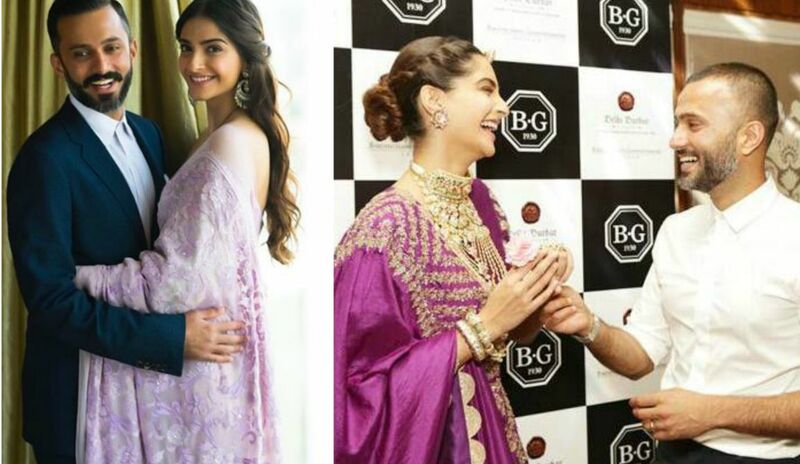 Bollywood’s fashionista Sonam Kapoor and Anand Ahuja are one of the most popular pairs and they continue to give couple goals with every appearance together. Everything they do makes news headlines, just like Sonam’s jaw-dropping gorgeous engagement ring had done. A small detail has now surfaced about the couple’s engagement and is making a buzz. Apparently, Anand did not have a ring when he popped the question to Sonam, and the actor said ‘yes’ without waiting for a ring. Sonam Kapoor made an appearance on the chat show, Feet Up With The Stars, hosted by stylist Anaita Shroff Adajania. During the show, Sonam revealed that there was no engagement ring when Anand proposed to her. Sonam and Anand never shy away from PDA and often display their affection on their respective social media handles. Sonam and Anand exchanged the vows on May 8 in a fairytale wedding in Mumbai. On the work front, Sonam will next be seen in The Zoya Factor and Ek Ladki Ko Dekha Toh Aisa Laga.